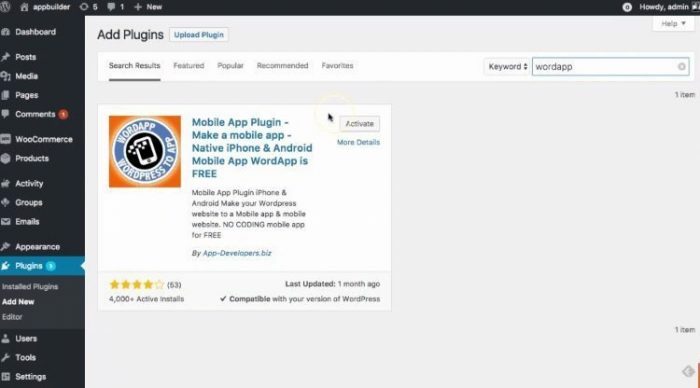 Today we will be reviewing the plugin WordApp which converts WordPress sites into a mobile app. So, at the WordApp offices, they claim that you can convert any WordPress site into a mobile app. We took the challenge and yes you really can convert your site very quickly into a mobile app, here is how. As with all plugins we are going to login to our WordPress website and click the Plugins->Add new tab and then we will search for WordApp and activate the plugin. After adding WordApp we’ll fast forward to creating our mobile app using the content from our WordPress site. Choose a theme or use your own website’s theme. Do you want just the mobile app or the mobile site too? 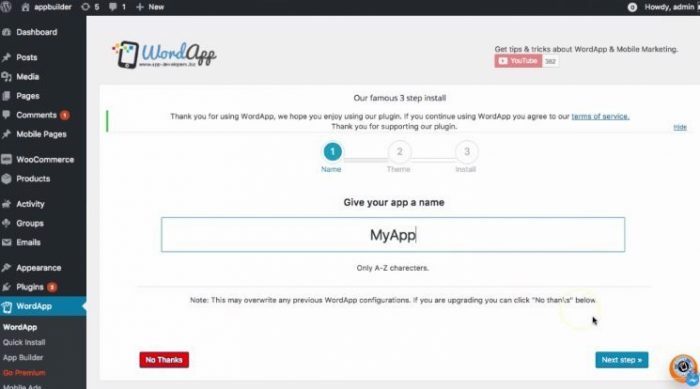 WordApp will then generate your mobile app using the information you entered and the information, content, and settings from your WordPress site. You will then be redirected to the mobile app builder where you will be able to choose colors, upload a logo, create your menus, a customize pretty much everything inside your app. Throughout the process, you will be able to see the changes in the preview window. 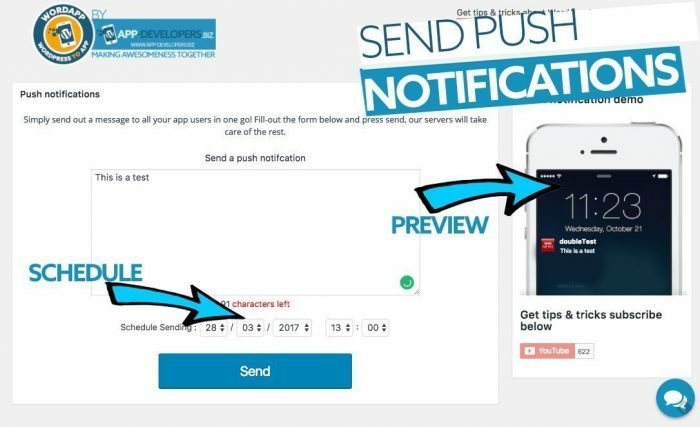 Once you have finished your app, simply navigate to the Publish App tab and enter your email address, followed by clicking the “Publish my app” button. You will then receive your app via email within 4 hours as quoted by WordApp. We got our app in about than 10 minutes :). Easy to build a mobile app. Cross platform mobile app builder for WordPress for both iOS & Android (windows coming soon). All your app content will sync with the content on your site. ● Use your existing theme & plugins inside the app. Predesigned mobile app QR codes and marketing gear. ● Schedule push notifications. Send push notifications as you add a new post. Send push notifications. Engage better with your app users thanks to a small message that you can send to anyone who has downloaded your app. Very powerful for any blog or small business. Imagine you have 1000 downloads, every time you update your blog you can send a quick SMS to all your users. Cool! OK, it may not make you a millionaire but thanks to the WordApp integration with AdMob you can monetize your mobile app. With banners and popup adverts you can get paid by google for including their banners on your app. There are many more features that we can’t list here. 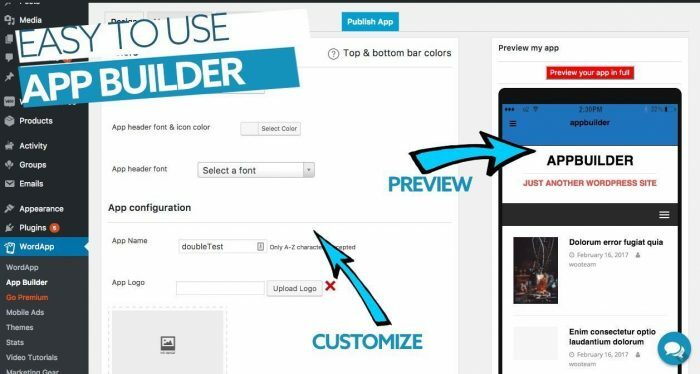 WordApp is easy to use and user-friendly app builder for WordPress. The best part about WordApp and their app builder is it is free! You don’t have to buy anything to get your app, although there are some premium features. See the WordApp specials here And yes you can really build a mobile app in 5 minutes with your WordPress site thanks to WordApp. So we here at WPArena are giving the WordApp plugin a big thumbs up. At my agency, most of our client uses Appresser. I would love to know how this compares to it. If any WordApp team is monitoring this comment, please chime in. This is the worst team I have seen in my 31 years of business career. These people are cheaters and biggest liars. Do not go on their words. They will never send you relevant replies and will always have reasons for their app not to work.